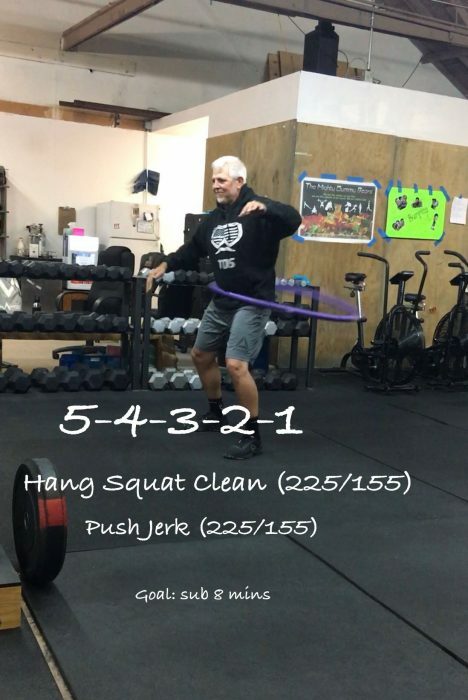 Loading on the barbell should be something that you can do a set of 5 hang squat clean in a row with as well as 5 push jerks in a row with. The trick is going to be going back and forth between these two movements. If you choose the weight right chances are you will be able to do the rep ranges from each set but it’s the rest between movements that is going to be tough to make you want to get back on the barbell. This is a short workout so keep the loading on the barbell something that allows for this.